Capitalizing on in-depth industrial knowledge and sophisticated manufacturing facility, we bring forth premium Pasta Making Machines. These machines are available in various technical grades for their use in food processing industry. They are precisely engineered using technically advanced components and machinery for making pasta of different shapes, easily and swiftly. They are widely acclaimed for low maintenance & installation cost, easy operation, reliable functionality and energy efficiency. 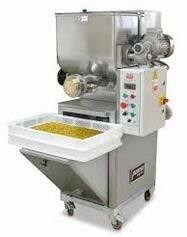 We are a renowned Pasta Making Machine Manufacturer, Exporter and Supplier from Delhi (India). Contact us for placing orders.